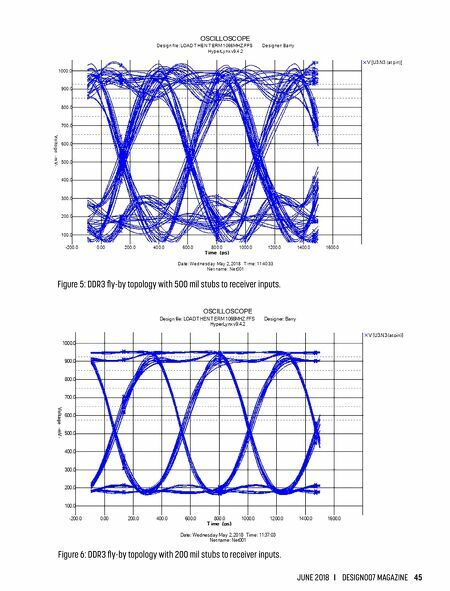 44 DESIGN007 MAGAZINE I JUNE 2018 Figure 4: DDR3 fly-by topology with end termination and 500 mil stub. • Reflections occur whenever the impedance of the transmission line changes along its length. • If the propagation time and reflection from source to load are longer than the edge transition time, an electrically long trace will exist. • If the trace is short, termination may still be required if the load is capacitive to prevent ringing. • Series termination is an excellent strategy for point to point routes, one load per net. • Parallel (end termination) is preferred for busses with a number of loads in a multi-drop topology. • Address, control and command (ACC) signals, traces should be routed directly to tions, does not need to be matched to the delay/length of the other signals in the ACC group. Also, further simulations confirmed that the length can be rather long (up to 3 inches) without any noticeable degradation of signal quality. Stubs to each receiver input, from the passing signal, should be kept below 200mil in length to maintain a clear eye. 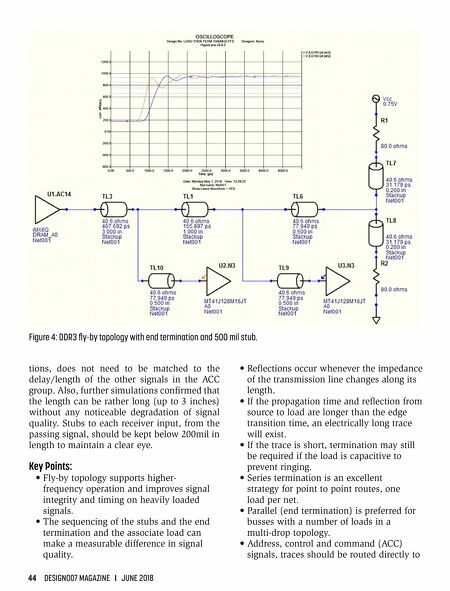 Key Points: • Fly-by topology supports higher- frequency operation and improves signal integrity and timing on heavily loaded signals. • The sequencing of the stubs and the end termination and the associate load can make a measurable difference in signal quality. Column — Multi-board Design: Multiple Challenges?